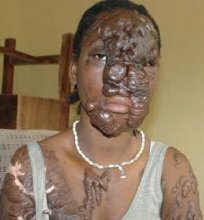 Welcome to Linda Ikeji's Blog: The story of Acid Victim, Comfort Sunday. Sorry about the graphic nature of the pic...but that's a human being...a victim of a superstitious belief. Please don't ask me to take the pics down. Incidents like this need to be brought to the fore front so people are aware that crazy things like this are happening in our society. For those who don't know her, Comfort Sunday is the 14-year-old girl whose father poured acid on her after a pastor convinced her family that she was a witch and the source of all her family's problems. The father took her to an uncompleted building, where he poured a tin-full of corrosive acid on her. Comfort was until the incident a JSS II student of Government Secondary School, Akwanga, and was living with her father, Sunday James, 61, and her stepmother, Justina Abimiku, 52. She lost her mom at a tender age and had been severally maltreated by her step mum. After taking her to the uncompleted building, the father blackmailed her into swallowing the corrosive substance, saying if she does that without throwing it out, she is not the devil being thought of. But if she does throw it out, then she was confirming the fears that she is a witch which has been smothering family members, including her late mother. So, she tried drinking it, to prove her innocence. It hurt, biting her tongue. She threw it out immediately. She was guilty of the deaths in the family, including of her very mother as her father declared. So her father overpowered her and ran the acid on her face, then he left. James was acting the script of a pastor whose name Weekly Trust could not obtain because he and the entire family is concealing his identity. The priest pointed at Comfort and accused her of the deaths in the family, alleging how she is in a cult which demands blood from her all times and called her a witch. He did not allow her to deny, as he took his fee and left without casting out the demon. Matters got worse for Comfort, as after being pushed her next door to her grandparents, her grandfather, Auta Anaku fell ill at this time and he passed on. Confession upon confession sprang up about how Comfort had told family members she is a witch. So, when James’ younger sister, Barmami fell ill in 2008, and was rushed to Abuja, she decided to explore other means to cure her illness. She ran to the pastor who followed her down to Akwanga to make the accusations. What followed was the acid bath. Better Leven, an NGO based in Akwanga, is trying to rehabilitate Comfort who had been in its custody since then. Timothy Tashi, programme officer of the NGO said on several occasions he contacted James and brought up the condition of Comfort, but that the father has always refused show any remorse even as the girl’s condition is not improving. Also, the NGO is having problems attracting government’s attention to her, just as the police have continued to look the other way. James is walking the streets scot-free after he made statements to the police. Meanwhile, a doctor, who chose to remain anonymous, stressed the urgent need for surgery to be done on Comfort’s face, as her condition may worsen, making correction difficult or even impossible. Victor Labesa, Nasarawa State coordinator of the Legal Aid Council, described the deed of James as barbaric and callous. He said with the Child’s Right Act domesticated in the state since 2005, James committed a crime against humanity and must be brought to book. But the police cannot act, as Comfort remains in pain, victim to the superstitious beliefs of those supposed to love and care for her. The Criminal Investigation Department (CID) of the police in Nasarawa State is investigating one Alexander Sunday, half-brother of Comfort Sunday, whose face and respiratory system have been disfigured after her father emptied a can of acid on her face in 2008 on the suspicion that she was a witch. Alexander, 22, is currently in detention after he was arrested by the police in Akwanga last Sunday, (January 2011) for allegedly poisoning the food of his half-sister the previous day at the family’s residence along Mai-Doki Street in Akwanga. Their father, Sunday James, has been in detention and will be arraigned in court on February 3, for allegedly bathing his daughter with acid in 2008. James walked freely initially, but pressures from the Tashi A. Tashi-led NGO currently giving care to the teenage girl, as well as the Legal Aid Council, have compelled the police to re-arrest him for prosecution, while he awaits arraignment in court. Comfort lost her mother while she was still young and had grown up under tough conditions because of maltreatment from her father and stepmother as well as her half-brother and sister, all of whom have raised emotions against her, alleging she is responsible for deaths in the family. Alexander was caught with a pot of food his half sister kept in her room, by other occupants of the house who insisted on knowing what his motives were. On opening the pot, they discovered the food in it was foaming with a black substance suspected to be poison. Comfort’s statement to the police indicates that she had long suspected her half-brother’s malice. She said Alexander had threatened to send her out of the house because she is responsible for the detention of their father. State police spokesman, ASP Richard Akoji, confirmed the incident and the arrest, saying the police are investigating Alexander for the alleged poison. This is not only barbaric and callous, it is inhuman. In this age and time, how could a father do this to his daughter. Even if she is a witch as alleged, is the acid bath the solution to the problem? The father, the step mother and the Pastor should be arrested and prosecuted. I don't know what evidence the police is looking for to prosecute the culprits. May God heal this girl and bring comfort her way. Sad that our society is so jaded as stories like this are commonplace yet nothing happens. To help end this terrible abuse we urge you to stand with us to Prevent Abuse of Children Today. There are lots of ways for you to get involved with the campaign, in particular signing our PACT, holding events and writing letters. Visit our website www.makeapact.org to sign the PACT and help us spread the word. Couldn't they have just kicked her out of the house? Why disfigure and scar her? OMG! This story is incredible sad. I cant imagine the pain she is going through. It’s bad enough having the physical pain, but knowing it’s ur dad that did it …SMH. I hope he rots in jail!! Linda thanks for bringing this story out. Nigerians need to be aware of the injustice carried out in our country. It’s not all about designer bags, clothes and parties. Is there anyway we can get in touch with the NGO? Wonder shall never cease, may God have mercy. Why hasn't the father been charged with attempted murder? You see and hear cases of such callousness everyday yet no justice for the victims. I wonder what all the christians that were attacking Muslims in your other post have to say about this now. This is even worse because the family does not care in anyway. Would it be ok for me to brandish all christians as barbaric because of this incident (and various more). I hope you have all learnt your lesson now. This problem of child witches has been going on for years. At a point in time Gov. Akpabio directed that there should be a clamp on the perpetrators of such nefarious activities but I guess as usual it was all just empty promises. I can't believe the police had no intention of prosecuting the father. @ least in Bangladesh, the offenders were arrested almost immediately without pressure from anyone. I pray that she gets the help she deserves. Most especially therapy because she has been through a horrific experience. Linda please find out if there is any account number money can be sent too. And I reiterate, please do not judge religions because of the barbaric acts of certain people. I just wish dat the girl is truly a witch, so dat she would show her bad side. My own father? Them no born am well. If the pastor is truly a man of God, y not deliver the girl instead? this is so sad...linda u should put a warning that a picture is graphic, thats pure decency...i had my 5 yr old cousin just cream her head off. no professional blogger will just put a pic like that. You guys need to put pictures like those before a cut, and at least warn of graphic content. Also, your homepage is not easily navigable and not very endearing to the eyes, make it better. Otherwise, nice blog. here you go again abeg make we hear word! Very sad...I dnt know when humans became gods.. to be treating people God took time to create in such manner. I'm smh for naija sha..
Why? Why should things like dis happen? What sort of pastor is that? Jesus Christ...I wasn't expecting that. Linda, I am very weak when it comes to looking at this kind of pic or the lady with bone cancer. I couldn't even read the story, all I know is that this is sad. Linda dear, can you please make graphic pictures smaller and people who want to see more can enlarge it. @Anon 6:41 I have no clue what you are talking about. When I sent my earlier comment there were still 0 comments. I was referring to an earlier post of Linda's about some girl whipped to death in Bangladesh so just relax. I didn't insult anyone and if you read the last line of my previous comment clearly you would see that I just said one shouldn't jump to conclusions about any religion (or non-belief in religion) so easily. Which you still did by the way. Why would you think atheists would hate on muslims? That's the same myopia I was hoping to correct. And I know that they are christians because they said they were christians. It really isn't rocket science to reply a comment with just a little bit of decorum now, is it? This is really terrible for a father to do. She was accused of being a witch hhmmm when they see this witch now they would run ooo. What a horrifying piture her father would surely pay for this and the person who accused her would get his reward. Nigerians, we are STUPID, STUPID, STUPID. It is a proven fact that when societies find themselves in turmoil under hardship, they look for scapegoats. And those tend to be the more vulnerable people in the society - children, aged etc. I am tired of these pastors. They come out with so much rubbish and we all believe them, hook line and sinker. They have destroyed so many lives, reputations and we continue to "worship them". Pastor say you it is evil to have pets, pastor say it is evil to have friends, pastor say jump up and down ten times, pastor say....and the madness continues. Our God is a God of reason, a God of science and a God of compassion. He is a GOd of light and of knowledge and empathy. These Nigeriam pastors, they preach darkness, ignorance, sordidness. It is all about wealth and acquisitions, there is no introspection or call to be better people. There is nothing God-like in their preachings. They prey on the ignorance and fears of people - like this father. The most cupable person in this whole thing is the pastor. STOP him before he ruins any more light. I am just sick sick sick sick and sick. I remember the BBC documentary on the abuse of children in Nigeria under the pretext that they were witches in the presence of oyibo christian friends. They were looking at me we shock!!! And one of my fellow Naija girls said: "well maybe they were really witches" I blame the born-again churches, I blame ignorance, poverty, irresponsible pastors driven by lust for riches. (I know I am ranting now). Why don't we find the children of the rich and wealthy being labelled as witches??? Who would dare??? Even pastor knows that these ones are sacred!! You need their money and goodwill. Oh this thing, it also shows socio-economic discrimination????? I am going to the PACT website now. I am tired of talking!! I want to do something - anything. But this has just got to STOP!!! If this girl's mother were alive, I doubt that this would happen to her. I bet it was the stepmother that was behind this. And for the so called "man of God" that suggested this, may he perpetually burn and rot in the hottest part of Hades. And it is this reason why I pray that I may live to see my children to adulthood so that no other woman will come in and oppress them. Tufia!